How To Get your Computer Fixed or What About The Geek Squad? So your computer is broken and you need to get it fixed. You'd rather it cost nothing, but you know it is going to cost. How much should you pay? And, who should do the work? Who do you trust to work on your computer? Should it be The Geek Squad? They are just about the only national computer repair outfit, affiliated with Best Buy and found everywhere that they are. I do not think they are your best choice, if you have a choice, but they do provide at least one useful service, which I am going to talk about. If you search online for "computer repair" or "computer help" using Google, you come up with a lot of local listings, some of which are paid ads (those on the right, and those at the top on a beige field), and then some which are displayed in Google rank order according to how well Google thinks the listing matches your search. But does that make the listings good? Or will they know how to fix your machine at a fair price? It's still hard to say. But you can take a look at some online info to see what services are available, at what prices, and in what packages by checking out The Geek Squad website. They list their services, where they perform them -- at their place, your place, and by phone, and what they cost and how they are packaged. Even if you don't use The Geek Squad, going through their service listings will give you a good working knowledge of what to expect, including the prices you may have to pay and the time it will take to get your computer fixed. I personally have no knowledge what kind of service you will get from The Geek Squad, though, because that will depend on WHO you get, on the phone, in the store, or at your home or business. For that you would need a recommendation from someone about the business or about the specific service personnel. Nevertheless, it's interesting to see by the charges and times The Geek Squad indicates for certain services, how long they expect, say, Virus/Spyware/Trojan removal to take and what you will have to pay. 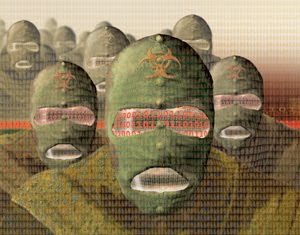 The Geek Squad lists a price of $300, for example, for Virus and Spyware Removal, as they put it, In-Home or In-Office. They charge $70 for Email Troubleshooting, but they do not offer that as a service other than by phone. Hardware install in the field starts at $150. They also make it clear that the packages do not combine -- that is, if you need Email help and Virus Removal, you cannot just lump them together at an hourly pro-rated price. You pay for one, and then the other. OK, I think that may be a little unreasonable and a little expensive, but the good thing about it is, you have a price and package with which to compare the time and cost estimates of other service providers. Most will give you an hourly rate and a time estimate for a particular job, and you should expect that. And they estimates are just that, ball-park figures. You can ask about the experience of the technician who is coming to take care of you, too. Once you have the dollar figures for a specific repair, you can also decide if the repair is worth it. We regularly see 6 and 7 year old machines that have gotten virus infested, or have suffered a drive failure, but whose owners think they should be fixed. You can easily see that malware removal at $300 is not appropriate for a machine with no value, which is close to what it can cost for a really bad infestation. Certainly that's what the Geek Squad charges. For the answer to that question and others, see Bring in the Clones, a previous article on backing up, and Buying a New Computer, really 2 articles, on what you should pay and what you need. Don't Send Your Computer to Dust Bunny Heaven! 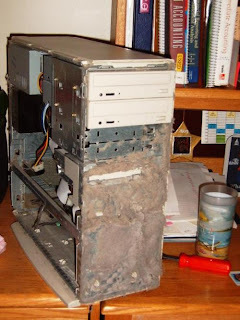 Beware of Dust Bunnies: they will send your computer to heaven! It's that time of year. Time to ... clean out your computer! No, not all that bloatware you've installed in the past 12 months, although getting rid of that stuff would be nice, but rather ... the actual dust and dirt that builds up inside the PC itself. It never fails to amaze us how invisible the actual machine becomes once it's installed. Except for popping in a CD or downloading a photo to it, who actually looks at the box? Not too many people. But all those little fans inside are spinning away, sucking dust bunnies into the case to the point where -- they can cause problems and FAILURE, sometimes spectacular failure. Dust is conductive, and can get into the open expansion slots and eventually short a connection causing a crash, or it can fill a power supply so that heat cannot be exhausted and so it dies, or, as in one exciting and memorable case, it can catch on fire from the spark in a short. You need to blow out the dust. A hair dryer on cold setting works well, and a vacuum cleaner with the hose reversed into the exhaust does, too. Or you can use a lot of expensive canned air, but the blow dryer is cheaper and just as good. Be especially careful to blow out all of the empty expansion slots, and any empty memory slots, as well as the power supply, heat sinks, fan blades, and cd/dvd or floppy openings. It could take a good 10 minutes to get all of that dust out of a machine that hasn't been cleaned in a year. After about a year and a half, or sooner, depending on the sticky stuff in your air, the dust will get a bit oily and hard to remove. Then you have a bigger job, that may take a lot of hand wiping. We see a lot of machines whose owners say, "I don't know what happened to it. It just died." Often, pun intended, they've Bit The Dust. Hey, cleaning the computer is necessary. You know, like changing the oil on your car. What??? Yes, you have to do that, too. Image courtesy of Tech Republic. Take a look at all of their other dust catchers!